A first-of-a-kind robotic space transporter with a futuristic autopilot control system journeyed into orbit early Sunday, embarking on a mission to track down the international space station using the most advanced space technology ever developed in Europe. The 42,700-pound cargo-laden spaceship, named Jules Verne for the visionary 19th century science fiction writer, was tucked inside Europe's workhorse Ariane 5 rocket for the dramatic blastoff. "We are embarking upon an extraordinary voyage," said Jean-Jacques Dordain, ESA director general. "It is no longer just a book written by Jules Verne, this is a reality." The Ariane 5 ES rocket, structurally bolstered to handle the hefty payload, thundered to life and soared into a rain-filled night sky at 0403:04 GMT Sunday (11:03:04 p.m. EST Saturday night). 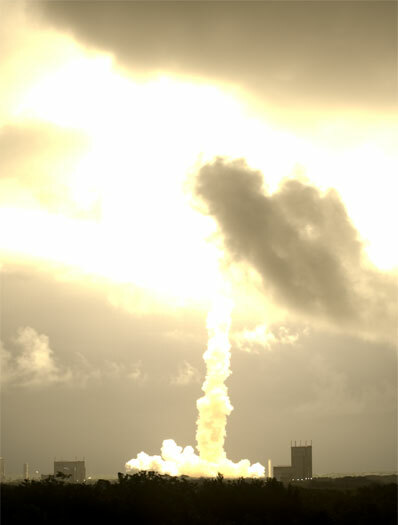 Shooting through low clouds blanketing the French-controlled Guiana Space Center, the 17-story launcher veered northeast away from the South American coast. Gaining altitude as it sped across the Atlantic Ocean, the rocket jettisoned two spent solid rocket booster casings and its clamshell-like payload fairing in the first four minutes of the mission. The first stage ran out of cryogenic propellant and fell away at about the nine-minute point. The Ariane 5 upper stage, consuming storable hydrazine fuel, ignited for an eight-minute burn to reach a stable low-altitude parking orbit. After coasting halfway around the world for 45 minutes, the stage's Aestus engine fired again to achieve a 162-mile-high circular orbit with an inclination of 51.6 degrees. The Ariane 5 released Jules Verne just shy of launch's 67-minute mark to begin a three-week pursuit of the station that will culminate with a scheduled docking in early April. The announcement of the milestone was met with a round of applause inside the Arianespace control room in French Guiana, and managers broke out cigars in a traditional post-launch ceremony. "Europe has just had a further tremendous success with a perfect injection into orbit," said Jean-Yves Le Gall, Arianespace CEO. "Today's success is primarily of the launch vehicle - Ariane 5," Dordain said. "We will talk about our success in April." After spacecraft separation, mission responsibility switched from the launch site to a control center in Toulouse, France. Roughly the size of a London double-decker bus, Jules Verne successfully unfurled its four solar arrays about 30 minutes after it unlatched from the booster, forming a characteristic X-shaped pattern resembling the wings of a dragonfly. Three hours after launch, the spacecraft was expected to deploy a critical antenna boom to be used for communications between the ship and the space station during final approach. 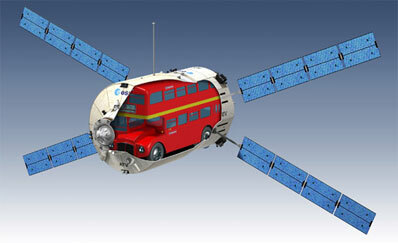 Jules Verne is the first Automated Transfer Vehicle for the European Space Agency. Ten European states spent $1.9 billion developing the spacecraft since 1995. France contributed nearly half of the funding for the ATV program, followed by Germany, Italy, and other European nations. 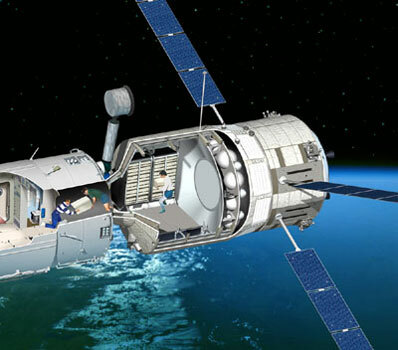 Under agreements in the space station partnership, the ATV's cargo-carrying capability covers ESA's 8.3-percent share of the program's operating costs. 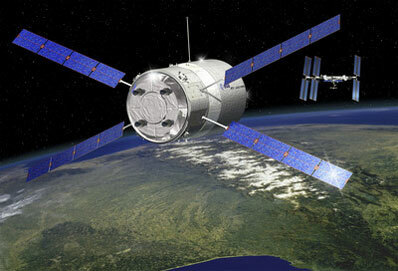 "We're really looking forward to using the ATV as a cargo delivery option," said Mike Griffin, NASA administrator. 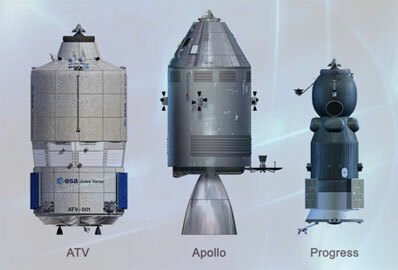 Four more ATV missions are scheduled for late 2009, 2011, 2012, and 2013, according to ESA officials. "You don't become a major player unless you can do your own operations, and that will come with ATV," said Alan Thirkettle, ESA space station program manager. Industrial giant EADS Astrium led a contractor team of thousands of engineers and technicians. Russia provided the ATV's docking system at the forward end of the ship. "ATV gives very high-tech work to (European) industry, it pays our fees for the station which enables us to do the world-class science and research that we want to do on the station, and it's a gateway to the future exploration ambitions that we have in Europe," Thirkettle said. Jules Verne's mission and last month's addition of the Columbus laboratory to the space station mark Europe's entry into the realm of human spaceflight, according to senior officials. "Last month, with the docking of Columbus, Europe got its own flat in the ISS building. With the launch of the first ATV, we now have our own delivery truck," said Daniel Sacotte, ESA's director of human spaceflight, microgravity and exploration programs. Some officials tout the potential to evolve the ATV's design into a crew transport ship. "It occurs to me that it's a fairly short step to go from the ATV to something that can carry crew," Griffin said. "It's only a short step from there to an independent European manned spaceflight capability." Thirkettle said a decision to implement such a plan would have to be approved by ministers from European member states. Any ATV upgrade to launch astronauts into space would require a significant investment, he said. Loaded with about 10,100 pounds of supplies for the station, Jules Verne's mission is one-half glorified shakedown cruise, one-half space truck. Inside a 16.1-foot-long logistics carrier with a volume comparable to the passenger cabin of a modern Gulfstream business jet, more than 2,500 pounds of stowed dry cargo awaits delivery to the space station. The supplies include 1,100 pounds of food, 300 pounds of spare parts for Europe's newly-delivered Columbus module, and 176 pounds of fresh clothing for the station's residents, according to ESA. Spherical tanks house about 1,900 pounds of hydrazine and nitrogen tetroxide propellants that will flow into Zvezda after Jules Verne's arrival. Another estimated 5,000 pounds of propellant will be used by the ATV's own propulsion system to raise the station's altitude and help steer it clear of orbital debris. Nearly 600 pounds of potable water and about 46 pounds of oxygen are also on Jules Verne's payload manifest. Jules Verne carries about two-thirds of the ATV's total cargo capacity, giving the craft additional flexibility during its experimental tests during the approach to the space station. Packed to the brim, the ATV can transport three times more cargo than the Russian Progress vehicle. "We're going to be the largest carrier of cargo to the international space station," said John Ellwood, ATV project manager. The first phase of the mission begins less than a day after launch, when Jules Verne's propulsion system fires up to begin a set of orbital maneuvers to raise the craft's altitude. See our detailed mission timeline here. During the series of engine burns, engineers stationed at the ATV control center will check out Jules Verne's propulsion, navigation and computer systems before allowing the ship to close in on the station. On Wednesday, controllers will command a mock collision avoidance maneuver, a critical engine firing that would push the ATV away from the station at 11 miles per hour during an emergency late in the rendezvous sequence. "We can only dock to the station if that backup system does indeed work correctly," Dordain said. The ATV will spend about ten days flying to a point nearly 1,250 miles in front of the space station, where it will wait out the shuttle Endeavour's upcoming assembly mission, scheduled to wrap up with an undocking on March 24. If Endeavour departs the orbiting complex on time, Jules Verne will begin moving toward the station on March 27, setting up for the first of two "demo days" to showcase the craft's ability to autonomously fly in close proximity to the outpost. "In each of those, we demonstrate various aspects of the ATV and prove that those features are working properly to ensure the safety of the vehicle and the station," said Bob Chesson, head of ESA's human spaceflight and exploration operations. Jules Verne is designed to fly on autopilot using sophisticated logic software able to process inputs from navigation sensors, ground controllers and the station crew. The craft will automatically fly toward the station through waypoints positioned at various distances from the complex. The ground team will give the "go" for the ATV to begin different phases of the rendezvous, but the ship's navigation and flight path will be generated on-board. During the March 29 demonstration, Jules Verne will close within 2.2 miles of the station using relative navigation data provided by GPS antennas attached to cargo freighter and the space station. The test will end with a ground-commanded escape maneuver to take the spacecraft to a safe orbit. Officials will review data obtained during the first demo day on March 30, giving the go-ahead to proceed with a docking dress rehearsal the following day if everything worked as planned. Jules Verne will drive to a distance of 817 feet from the station using GPS navigation to begin the second demo day. Once past that critical transition point, the ATV will begin relying on information produced by a suite of laser sensors on the forward end of the ship. Two videometers will fire pulses of laser light toward the station one-to-ten times per second. The light will be reflected by 26 reflectors acting as space-age mirrors attached to the back end of the station's Zvezda service module. The reflectors will create unique light patterns captured by the ATV cameras, which will allow the ship's computers to accurately determine its orientation, closing rate and distance from the station. Two other radar gun-like sensors known as telegoniometers will serve as a backup during the final rendezvous. "We're the first vehicle which will completely automatically, using optical sensors, dock with the space station," Ellwood said. During the docking dress rehearsal, Jules Verne will demonstrate its ability to respond to hold, resume and retreat commands sent by the Toulouse control center and the station crew. The ATV will approach to a range of just 40 feet from the Zvezda aft docking port before Russian cosmonaut Yuri Malenchenko gives an escape command from inside the outpost, testing the crew's ability to intervene if something went wrong. The first opportunity for Jules Verne to link up with the station will come at approximately 1420 GMT (10:20 a.m. EDT) April 3. The ATV has a window stretching from March 30 to April 5 for the docking, or else the craft will wait until after a scheduled Soyuz crew rotation mission ends on April 19. The early April docking window also requires that the shuttle Endeavour launch by Wednesday or Thursday, allowing the shuttle to complete its mission and leave the station by the time Jules Verne approaches the complex. Space station flight rules dictate that visiting spacecraft can't rendezvous and dock with the outpost when a shuttle is present. Jules Verne's docking sequence is similar to the activities the ship will undergo during the second day of rendezvous testing. First using GPS navigation, then optical instruments, the ATV will fly to hold points at 2.2 miles, 817 feet, 65 feet and 30 feet from the station. After a final "go" for docking, Jules Verne will guide itself into Zvezda's aft docking port to end the high-wire rendezvous. Astronauts will unload the ATV's cargo, replacing it with waste during the ship's four-month stay. In early August, Jules Verne will undock from the space station and plunge back into Earth's atmosphere, destroying the vessel and the outpost's discarded trash over an unpopulated area in the Pacific Ocean.